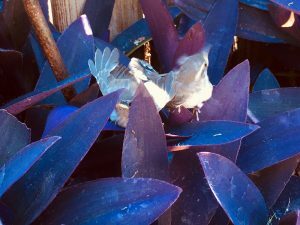 Well, the flowering season is surely upon us and, with it, many reminders of the natural biological and energetic processes we are all subject to when it comes to metabolizing change and beginning to lay down the new neural networks of integration. 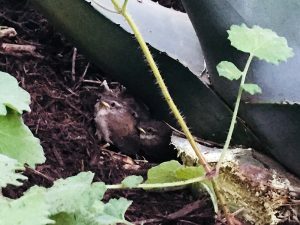 These sweet little wren fledglings drove this home to me as, after 12 days of growing and cheeping in their well-hidden nest high up in the rafters of my back porch roof, they dropped to the ground, sought safe harbor from my two predatory cats beneath the protective arm of a very large and sharp agave, and then learned to combine hopping and flying to navigate their way safely out of my fenced-in back yard – all in the span of less than 8 hours time. Talk about some new neural networks forming at light speed! How they did this was through a combination of the natural unfoldment of the seed of growth and evolution already within them, listening to and honoring intact instinct, and following the mentoring calls and guidance of both parent wrens who called out to them in regular intervals to help them determine where they needed to go and, possibly, how to get there. Oh, how I wish I spoke “wren” so I could really know what wisdom was being imparted through those beckoning calls!. 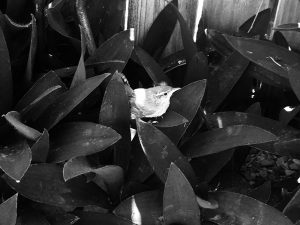 Each of the four wren-lets figured out how to get out of the backyard differently. One discovered that she had wings and in a grand effort that may have surprised even her, she was off and over the fence on her first try. Another one hopped his way through the Purple Heart and to the edge of the fence gate to find that he was small enough to just hop right under it. A third side-hopped hir way between a gap in the fence posts into the neighbors yard where there were no lurking pets. And the last one painstakingly used her wings to fly a little bit up on the fence slat and perch w/ her feet and then try to fly a little higher to get a foothold higher up. Over and over, she would get to the cross beam at the top of the fence which would knock her to the ground 5 feet below where she would start over. Eventually, she figured out how to hop wide as she got higher and she, too, found her way over the top. This was such a reminder to me of the importance of self-compassion, being tender and gentle with ourselves, when we are creating and learning new templates for being in the world that push and challenge the edge of what we think we know. It also mirrored back the importance of allowing generous space to get to each next step of growth in our own time and unique way with ample opportunities for making mistakes, learning from them and trying again anew. Lastly, I am reminded of the need for and importance of mentorship – to know that someone is tracking our movement, struggles and growth and offering a gentle, yet reassuring, reminder, that they are there, that they have some sort of map for what might need or want to happen next and that, while the work of growth is surely our own, we are not alone as we stumble, fall and find our wings to fly.